My feelings about this skirt are too extreme for mere fabric design - but then, I have just been almost moved to tears while reading 101 Dalmatians to Item, so it's just possible I'm in a fragile mood. In short, whoever created this design should be knighted for services to the realm. Yet, if there's one thing that's stuck with me from that short textile design course I did at St Martin's, it's the fact that designers who sell to the big stores will frequently be paid peanuts, knock off scores of designs every day, and see their work replicated all over the place, uncredited. I hope this person fared better. Here's an image of the actual fabric. 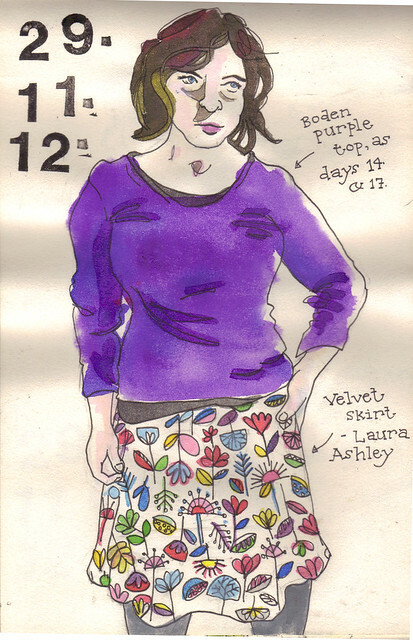 It's a Laura Ashley skirt, velvet, on a white ground. It is so unlike anything I have ever seen Laura Ashley do, before or since: it just leapt out at me from across the shop, back when there was a Brighton branch. I wore it to a job interview for an arty/museum/web editorial position once. I didn't get the job, but my skirt was much complimented. The only other thing you need to know is that my bra is doing extreme things in the uplift department today, which also has quite a pleasing side-effect of emphasising the waist, not that anyone much saw me today. I didn't even do the school run. 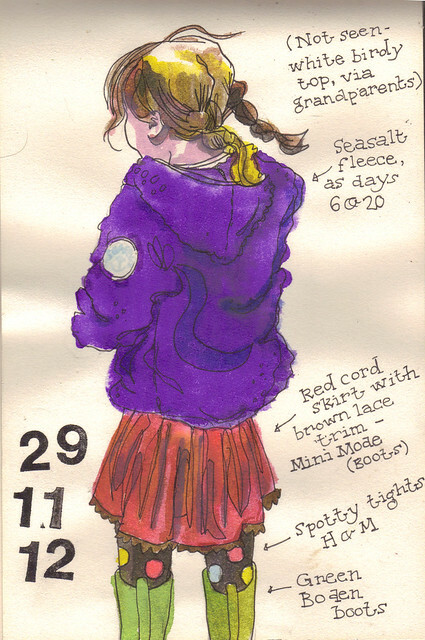 Item was in a sweet long-sleeved top with two birds on it, and a red corduroy skirt she's had for years and years. I like the massive-fleece-tiny-skirt silhouette on her.